On Friday, May 24, we picked up the first 970 /10,000 of Haskap dormant plugs from Haskap Central Sales Ltd close to Prince Albert SK. They were packed in boxes of 120, with bundles of 5 wrapped in cellophane, and still frozen since they’d been stored dormant and frozen since last Nov, 2012. The plugs were in good dormant condition, and some of them were even showing some new growth–little bits of green buds and leaves and some green showing above the root line as well. These plugs were developed last year in Haskap Central Sales greenhouses. We put the boxes in our little supply trailer, and headed for home. That night, my brother, Collin, came from Cold Lake AB, prepared to work hard for a day or two helping us unpack, figure out the planter, and work out a system. We considered this first acre our ‘practice’ orchard, since it’s close to the house, and the land has been ready for 2 years. It’s very loose, fluffy and nutrient packed soil, since it used to be a cow enclosure, and then was grown green manure for about 10 years, that was plowed under every year. So the soil testing for that plot advised us that we need not amend it at all, and in fact, the soil might actually be ‘too’ rich; something we didn’t think possible. There are a further 15 acres prepared and cleared and cultivated, half a mile north of the homestead. 8 acres of that will house the remaining plants in the beginning of June, 2013. That soil is still frozen at the 6″ mark!! Saturday, May 25 was PLANTING DAY. We spent the first 5 hours unpacking the boxes, and while waiting for the plants to thaw that we could separate the bundles, we practiced with the planter and created a system that worked. We also had to adjust the spacers to 30″ (current recommendation by Haskap Central for commercial harvesters to successfully and efficiently harvest), and also adjusted the furrow maker and the closing wheels to be exact so they would leave a properly planted plug. And so it began. From about 2 p.m. to 5 p.m. with Peter driving, and Margie and Collin on the planter (they also had to separate plants, and run them in trays to the head of the rows), we averaged a planting speed of about 300 to 400 plants an hour. We also had to fill the water tank 3 times as each plant takes a cup of water on the planting. I’ll get some photos later, but for now, there are videos available on YouTube of the process. Our planter is from Eastern Farm Machinery Ltd, and it’s Model 1000 B-3, and it was quite efficient and quite intuitive to use. We expect that we will be able to easily plant 500 plants an hour on the 8th of June. Our son, Alec, in 1987. 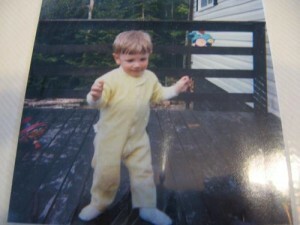 He was 13 months old and this was a photo of his First Steps. He’s now 27 years old and has a 2 year old and a bun in the oven. This entry was posted in Ford 8N, General Info, Plants, Tractors and tagged haskap orchard fruit planting machine mechanical planter bee honey garden gardening hobby sales commercial production processing. Bookmark the permalink.